As summer hits (it’s 102 degrees as I type this! ), no one’s really in the mood to cook an extravagant creation. I get that. 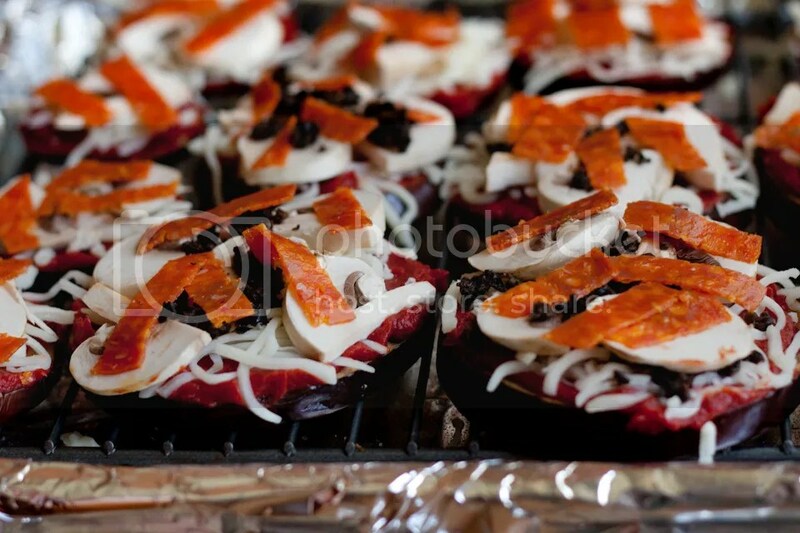 That’s why I have simple, easy recipes like my little eggplant pizzas to get through the scorching days. There’s not a whole lot to this recipe, but it’s the perfect little distraction that seems to be most appealing when we don’t want to spend a lot of time in the kitchen. In general I don’t like using the oven while it’s hot out, but these little babies cook up relatively fast so I don’t mind them so much. We do something really similar where we roast the eggplant and layer it with spaghetti/pizza sauce and cheese, but it never occurred to me to add pizza toppings. Genius! Very clever indeed! Looks much lighter than those ‘meatza’ type crusts. Looks great, is there a way to just print the recipe? Thanks for all and Happy Fourth of July! You might like the ziplist plugin – it will allow your readers to save and print recipes. Great site by the way! Mind if I post some of your recipes with credit back to you? I’d love to share them! Hi Jen, thanks for the tip re: ziplist – unfortunately I’m still on wordpress.com so I can’t use plugins yet. I’ll probably switch to wordpress.org sometime soon. Feel free to post any of my recipes! I like you had to wait until I had health issues to start thinking about eating differently! If you could figure out a way to put a print recipe button your site….that would be awesome! I am just learning on the Paleo diet as well so I need all the help I can get! Jeff: Look into NutriBullet. Liquifies fruits and vegs. So they can be absorbed much easier. This is not a blender. Also, no waste, unlike a juicer. So simple and so brilliant, love it! Eggplant goes so well with the tomato/cheese combo (think eggplant parm). I always use eggplant slices instead of noodles in lasagna, but haven’t thought of this before. Thanks! Thanks Sofia, let me know what you think of it if you make it! This is absolutely my favorite low-carb way to have pizza now! Yours look soooo good! I am going to do these on the grill! 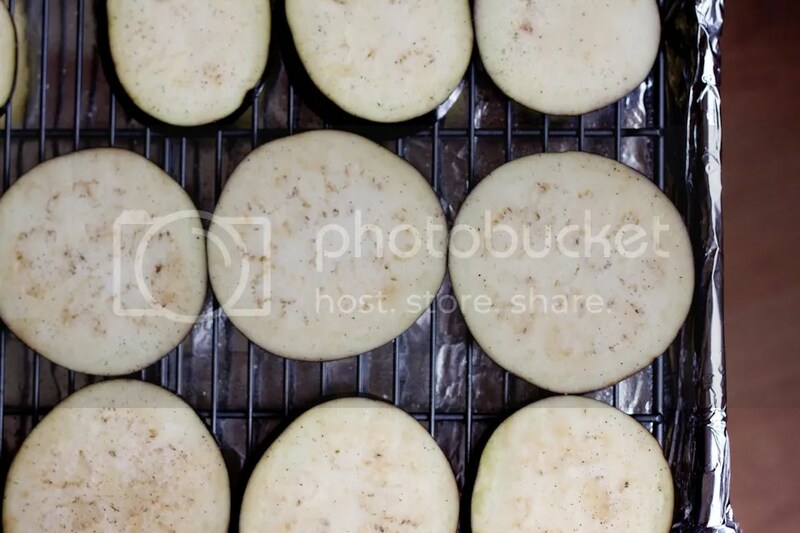 Salt the eggplants, let sit for 15 minutes, then wash and pat dry – takes some of the bitterness out. I save the recipes that I like on Pepperplate.com. That’s where this one is going. Great idea! Nice, Kathie, let me know how it turns out! 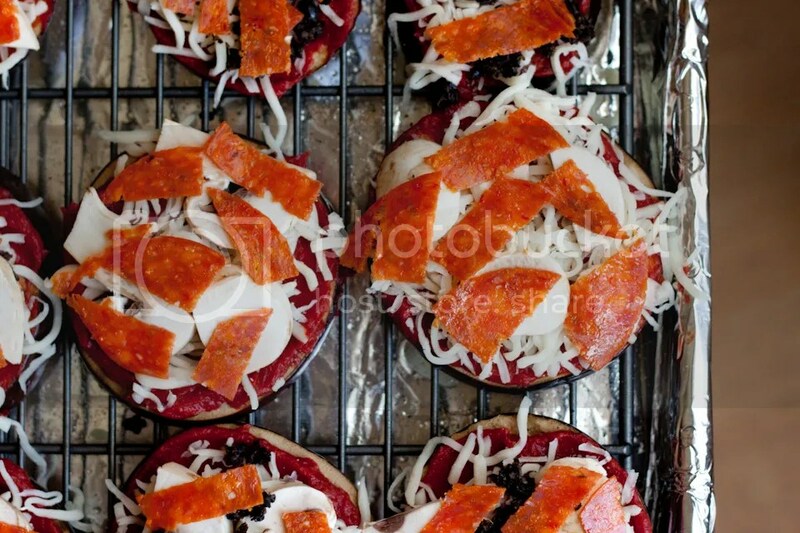 Great recipe – can’t beat eggplant as a pizza crust substitute. Also, love your photography. This looks awesome! In the winter I make a modified eggplant parm with basil or red pepper pesto but it’s way too hot to turn the oven on in my apartment now. This post was totally a light-bub moment for me. I’m totally going to try this tomorrow on the grill with pesto, fontina, and mushrooms. I just made these for a veggie family. They’re delicious and no where near at bitter as my mom’s eggplant used to be. :) I like the thinly sliced pizzas better, but you’ll definitely need a fork for them. Thank you for sharing this idea! Beverly, sounds delicious! Thanks for sharing. Tried this tonight and we liked it however for some reason it was still bitter. I don’t think I cooked them long enough as they were still pretty firm. Could that be why they were bitter? Also, the skin seemed more bitter than anything.. is it better to peal them? Pingback: I heart you Domestic Man! Eggplant Pizza! « Watch out… Lady's in the kitchen! What a creative, delicious and healthy idea!!! I love it. Thank you! Hi Lori, 1/4″ should be fine. If this is your first time trying eggplant, I would recommend peeling the skin off of a couple of them and trying them that way – some people aren’t fans of the somewhat bitter skins at first…hope that helps! Fantastic… thanks Russ! I’ll make sure I pick one up next weekend at the farmers market! I made these tonight. They were delicious and very easy to make. I will definitely be making them again! Yum!! Such a good idea! I feel like this a perfect way to sneak yet another vegtable into my little ones diet!! They also claim it’s from a cookbook they sell. I tried to report the post as an intellectual property theft, but apparently only the content creator can do that. Good luck! Hi Angela, thanks for catching it. I’ll take it from here! Dude, OMG, THANK YOU SO MUCH for this recipe. It totally killed my pizza cravings. I made these last week and they are to die for! I added some Italian seasoning and garlic powder…delicioso! 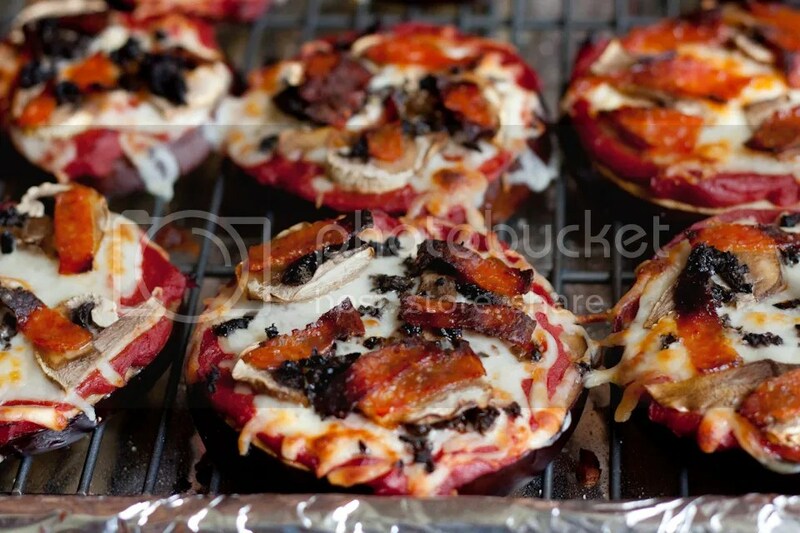 Pingback: Eggplant Pizza | What? No Milk?! I’ve been interested in eating more vegetarian meals and reducing my flour intake. I’m not entirely sure what a paleo diet consists of, but I’m interested to learn more. So far, the recipes I’ve seen that are paleo-friendly have looked healthy and delicious. This looks amazing, and I’ve been wanting an excuse to try out eggplant since I’ve never cooked one before. Thanks so much! I’ll do a bit more research on my own to learn more about paleo.